I don’t always wear make-up, but when I do I tend to wear some pretty intense make-up. Primer, highly pigmented eyeshadows and liners, glitter more often than not; all things that are notoriously hard to remove. I’ve tried lots of make-up removing wipes and none of them manage to get all of it off and most leave my face feeling dry or like there’s a strange film left on it. One day in the make-up remover aisle while trying to decide what I’d take a chance on this time I happened to spot the Pond’s cold cream and decided that perhaps there were sometimes when the tried and true method was tried and true for a reason. 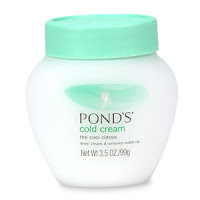 Pond’s cold cream (or any cold cream, really) is a mineral oil based cream that bonds to the dirt or make-up on your skin to remove it without harsh soaps or cleansers. To use it you apply a thin layer of cream over your entire face, massage it in and then wipe it off with cotton balls or a warm damp washcloth. It’s messier than most cleansing wipes but my experience has been that Pond’s get everything off with one application, whereas most of those cleansing wipes require you to scrub a bit before they’ll get some of the more stubborn make-ups off. Plus, it leaves your skin feeling moisturized rather than stripped clean and coated with weird filmy stuff. However, when I say it’s messy I’m not joking. Properly applying cold cream means it gets all over your face and hands and then (if you’re me) you have to try and find a way to wipe your hands off without being able to open your eyes because of the layer of cream over them. When I was using cotton balls to remove the cold cream from my face I’d regularly use 6-7 cotton balls to get all of it off. Any washcloth you use to take it off will have to be laundered fairly regularly since the oil-based cold cream won’t rise off or out easily the way soap does because oil won’t bond to water. Also, what I call “moisturized” some people might call “greasy” and while Ponds claims that the cream won’t clog pores the feeling may be off-putting to many even if it won’t actually lead to breakouts. Overall, I’d give Pond’s Cold Cream a 5 out of 8 tentacles. It’s not easy or simple to use, but if you’re looking for something that’s gentle yet effective at removing make-up, it’s nearly impossible to beat. Anytime I picture cotton balls and the act of removing makeup, I see Ben Stiller in Zoolander where he's trying to remove the coal soot from his face. Mer-MAN! I use cold cream too, but since I rarely wear more than eye make-up, I just apply it to that area. And I use tissues to remove it. I've found that with waterproof mascara, I have to let the cream sit on my eyelashes for a while to really break down the mascara, and that I usually need to do a second application of the cream. Revlon used to have a make-up remover, specifically designed for their ColorStay line that worked wonders. I don't think they make it anymore and I really miss it. This is my go-to moisturizer! I use Nuetrogena's makeup removing cloths (LOVE them, please review them!) and then just a light amount of this rubbed in for moisturizer before going to bed. I have really dry skin and it's perfect. I love the price, too!